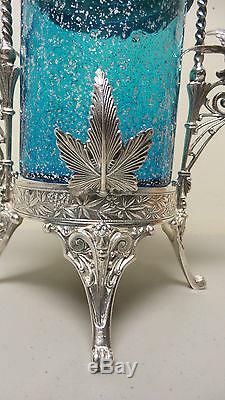 This listing is for a wonderful unusually large Victorian Period pickle castor with beautiful aquagled glass insert and elaborate Meriden Silver Plate stand. 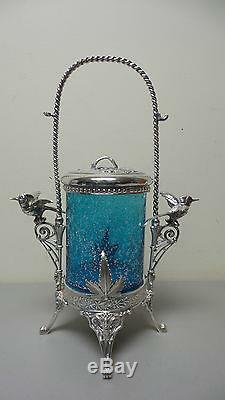 Huge aqua glass insert with silver mica decoration is in excellent condition with no noted damage. 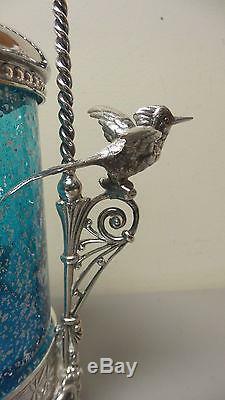 Elaborate silver plated stand with hummingbirds mounted on sides with tall twist/rope handle and four ornately decorated tall feet. Decorative lid with embossed berries and fruit in high relief. The stand is stamped "Meriden 192" on base and is in very nice condition with no noted damage. There is an attached slot on one side of the stand for hanging pickle tongs. Although we are not including the tongs, they are inexpensively found in local antique malls and shops. The glass insert fits correctly into the stand and the silver lid fits appropriately on the insert. Lid and insert appear to be original. You won't find a more spectacular pickle castor! The stand measures 15 1/2" high (at top of handle), the jar measure 5 1/4" tall and 4 3/8 in diameter. We at Antiques & Moore have been in the Antiques business for over 30 years and try to describe our items as accurately as possible. We are happy to answer any questions and always appreciate your business! 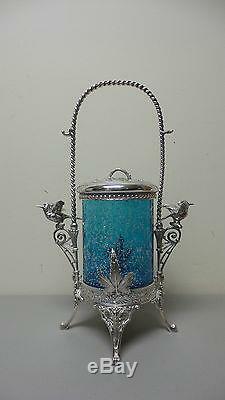 The item "RARE HUGE VICTORIAN PICKLE CASTOR, AQUA GLASS INSERT, MERIDEN SILVER PLATE STAND" is in sale since Monday, May 04, 2015. This item is in the category "Pottery & Glass\Glass\Art Glass\North American\Other North American Art Glass". The seller is "antiquesandmooresales" and is located in Hendersonville, North Carolina. This item can be shipped worldwide.